On April 13, JB ColoringBrush Painting LLC announced the names of the winners of its first ever Paint It Forward exterior painting giveaway. The first winner was Robert and Wanda Girard. Wanda Girard submitted a letter describing her health issues and hard financial situation. She is scheduled to have two separate knee surgeries. Robert Girard is a retired veteran and suffers from seizures and other health issues. 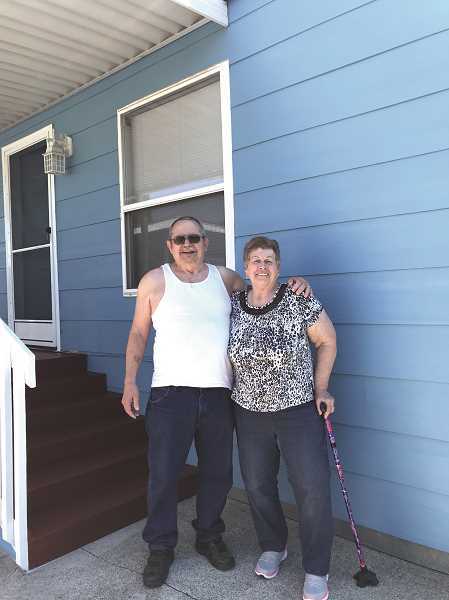 "We were very delighted to help them with the painting of their house," said owner Blanca Gutierrez. The exterior painting job was completed May 12. Terrie Edkins is the second winner of the Paint It Forward giveaway program. Gutierrez said the company is working on getting that painting scheduled shortly. The Paint It Forward program was started by Woodburn residential painting business JB Coloringbrush Painting LLC to celebrate its seventh anniversary in business. Through the program, which owners said they plan to make an annual event, the company donates $4,000 worth of painting services (including labor and materials, and a donation of paint from Sherwin Williams in Woodburn) to a worthy recipient. Nominations were solicited early in the spring for deserving families or nonprofit organizations in need of services. Candidates could be someone struggling due to illness or financial burdens, or a nonprofit struggling to make ends meet while helping others. The Woodburn company received various nominations, three of which were for families and two for nonprofits. "We know that in life there are hardships which prevent people from being able to afford painting services that they need," Blanca Gutierrez said in a press release. "We want to help!" Javier and Blanca Gutierrez started the company in April 2011.